When William Preston Bowling opened the Aerospace Cancer Museum of Education (ACME) May 13, 2008, he offered West Hills resident and founder of CleanUpRocketdyne.org, Christina Walsh, an irresistible partnership: a fully functioning facility that would be unlike any other museum in the world. Walsh jumped at the chance. Soon community meetings were taking place at the Southwest-styled building that once was a yoga studio along Valley Circle West. Under the direction of Bowling and Walsh, ACME promised to serve an important role in educating the community on SSFL’s past as well as current cleanup efforts. 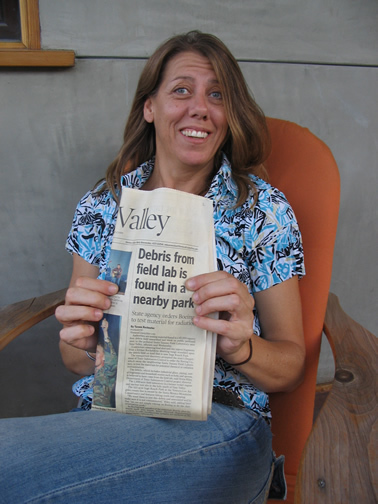 Walsh had first came to this reporter’s attention in 2004 at a celebration of Rocketdyne-adjacent Ahmanson Ranch collapsing under the weight of perchlorate revelations. That land, even larger than SSFL in area, became state park land instead of the huge development that now-defunct Washington Mutual had fought for. What I hadn’t fully realized at the time is that Walsh was already prone to ruthless behavior. Her success at ACME had only fueled her zeal, need for recognition, and relationships with polluters and compromised government staff – all of which made her a perfect target for Boeing’s plan to undercut Hirsch and the Work Group and in effect replace the community. A CAG was not needed – the SSFL Interagency Work Group had been an effective vehicle for public participation for over 20 years. But the Work Group members wanted SSFL cleaned up to strict standards, and Boeing did not. A replacement group was required, and an SSFL CAG would do just the trick. This was, and is, classic astroturfing. “In the Summer of 2009, without my knowledge, Christina Walsh, founder of CleanupRocketdyne.org, accepts a meeting with The Boeing Co. then asks me to ‘Tag Along’ for ‘Support,” Bowling told EnviroReporter.com in an e-mail October 14. Bowling initially supported the CAG but grew to oppose it after his relationship with Walsh dissolved. 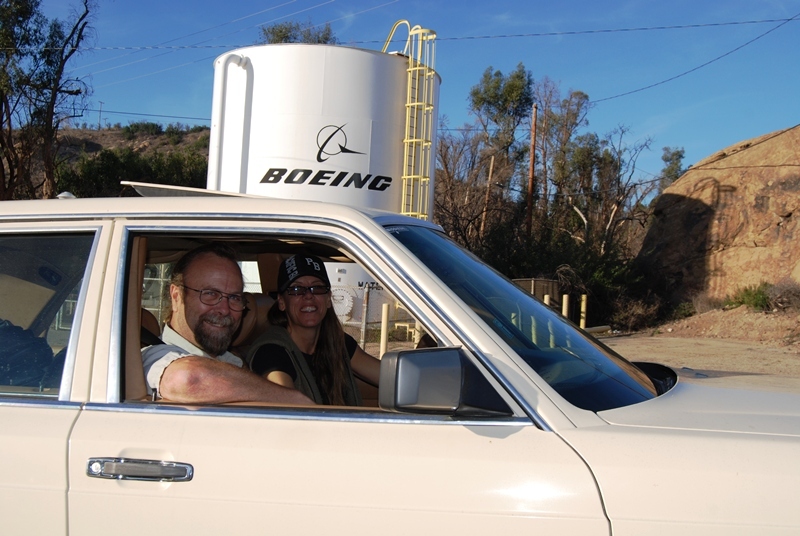 “I had no knowledge of what was on the agenda until we got up to the Santa Susana Field Laboratory (SSFL) and met Tom Gallacher (SSFL Site Director for Boeing). 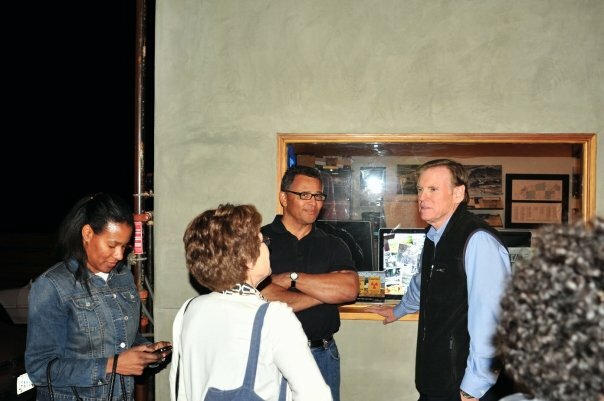 Riley was an enormously controversial DTSC supervisor for both the SSFL and Runkle Canyon properties. He was first greeted enthusiastically by the community as he seemed like a straight-shooter. That honeymoon did not last long as it soon appeared that Riley felt that the law passed to protect and cleanup SSFL, SB-990, was too strict and shouldn’t be applied. The letter from elected officials that Walsh refers to was a March 9, 2009 letter to then Secretary of CAL EPA Linda Adams decrying Riley’s efforts to push for a CAG. 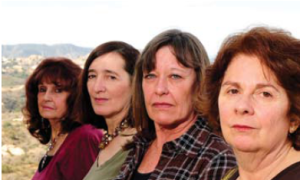 “We cannot see how an issue this technically, legally, and politically complex, and with such a long and tangled history, including the involvement of the Federal District Court, could possibly lend itself to a CAG,” states the letter signed by Assemblywoman Julia Brownley, State Senator Fran Pavley, former State Senator Sheila Kuehl, Ventura County Supervisor Linda Parks, and Los Angeles City Councilmember Greig Smith. Walsh went ballistic with Riley’s removal and took to wearing “WWNRD?” black shirts standing for “What Would Norm Riley Do?” She kept her eye on the prize, however, as Boeing helped her negotiate her way to create a CAG. “Turning in 51 signatures today to petition a cag,” Walsh wrote Sams November 24, 2009. All of this disruptive and dangerous behavior is evidenced by an avalanche of e-mails, forum posts and threatening voice mails generated by Walsh. Even Bowling tired of Walsh’s tirades and antics, and separated from her in 2010 after she tried to blame the closing of ACME on Hirsch and others. But instead of addressing the behavior or distancing itself, DTSC only coddled Walsh more, creating a “Public Participation Group” or PPG that operated much like a CAG. DTSC coordinated the PPG but was reimbursed by the responsible parties, who customarily reimburse DTSC for its efforts in remediating toxic sites. Longtime SSFL activists found the PPG meetings unproductive and claimed PPG membership was stacked with cleanup opponents. Walsh wasn’t satisfied either, as she wanted Boeing, DOE, and NASA to be included as PPG members as well. 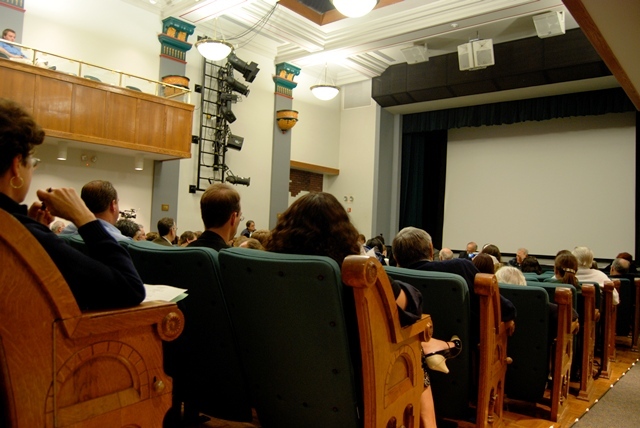 The general public and media did not attend the PPG meetings, which were viewed as too technical in nature. But the idea of a Boeing-funded CAG that could replace the Work Group was not dead. All Boeing needed to do was wait for a new state administration more friendly to its cause. Boeing was also able to exploit the ambitions of San Fernando Valley resident John Luker. Luker is vice president of the Santa Susana Mountain Park Association, an organization whose mission is to “continue to preserve and protect habitats for plants and animals native to the location, unique geological formations, and sites of ethnological, archaeological, and historic interest.” While laudable, the group’s mission made it, and Luker, susceptible to the notion that Rocketdyne shouldn’t be cleaned up to background. In a September 2010 email to Boeing, Luker asked for help checking for factual errors in copy accompanying a Flickr gallery of SSFL habitat that was going to be “stripped for short term political advantage” by the cleanup according to Luker. “I understand if some of you cannot comment, but, I wanted to make you all aware of what I’m going to be saying,” he wrote. Luker did not respond though he has, from time to time, tried to engage me in hot story tips that he has never produced. His photos have since graced Boeing’s SSFL calendar and newsletter. Luker shares Boeing’s “vision for open space” and the curious contention that full remediation back to the way the lab was before being grossly contaminated would be worse than leaving the pollution in place. But Luker’s motivation seemed to be as much about his status in the SSFL activist community as it was about what happens at the site. Early on, he was drawn to Walsh and Bowling for their leadership in the community as directors of the ACME facility. However, he was also hob-nobbing with Boeing, as a March 16 2009 e-mail from Walsh revealed. Walsh chided Luker for threatening her that he was “making side deals with Boeing” and telling her that if she wanted to know more she had better make him her (ACME’s) managing director. “I’ve been talking to Dan,” Luker wrote in a March 16 , 2008 e-mail to Walsh, “and he is of the opinion that everyone needs to stop the hate.” This is ironic, considering the hostility Luker would later direct at Hirsch. 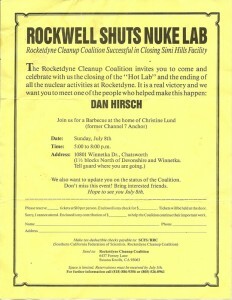 In an April 2010 e-mail, Luker stated that no one in the community had the leadership skills to run a CAG “myself and Dan Hirsch included,” indicating he fancied himself in Hirsch’s league. But Luker was trying to work both sides, and that could only last for so long. After he couldn’t talk Hirsch into going for lower cleanup standards, he went on the attack. He developed a fixation that became increasing obsessive and decidedly nasty. In a series of e-mails, Luker repeatedly attacked and interrogated Hirsch and demanded that he talk or meet with him. 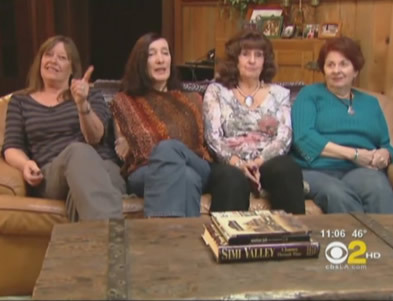 Luker also sent the messages to other members of the community, demanding that they make Hirsch talk to him. The questions Luker demanded that Hirsch answer read more like a list of accusations, and absurd ones at that. He demanded that Hirsch prove he went to Harvard, to know who his “resource people” were and when he could meet with them (“I have been asking this question for 2 years and NEVER gotten an answer!” he exclaimed), how much money Hirsch made, if he was a registered lobbyist, if his students knew he does research for a private foundation, and more. 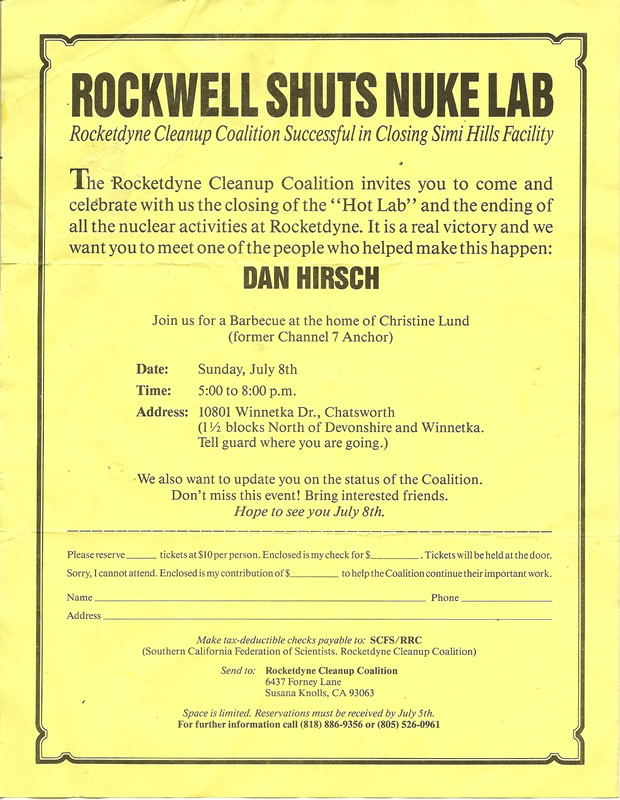 In one exchange, Luker berated Hirsch for “bullying the little old ladies you hide behind” and then forwarded the e-mail to the members of the Rocktdyne Cleanup Coalition, to whom he was referring, demanding that they answer his questions. Luker also gloated that he had been studying Hirsch for six years and it paid off as “important people” were now introducing him to legislators. “Why shouldn’t the Boeing Co make a profit off this cleanup?” he asked in an insult-laden e-mail to Hirsch that ended with an invitation to lunch. The cumulative effect of this kind of behavior is that it disrupts the process that will lead finally to conclusion, cleanup. 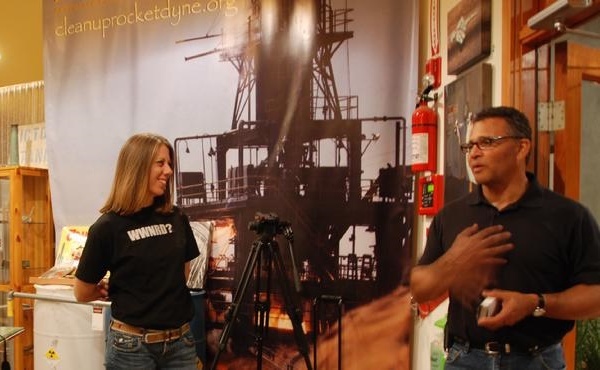 It does that primarily by just being offensive and harassing, which drives away multitudes of residents who live close to Rocketdyne, a process this reporter has witnessed since 1998. Typical community members just don’t want to deal with hostile people, let alone ones playing one-upmanship with each other and footsie with the polluter at the same time. In January 2011, Governor Jerry Brown took office, appointing Matt Rodriquez as Secretary of Cal-EPA and Debbie Raphael as DTSC Director. For Boeing, things began to look up. By this time, Walsh had grown to disparage SB 990, the state law she had once fought for, as well as the Agreements on Consent which required DOE and NASA to cleanup their portions of the site to background. She claimed that the Work Group did not represent her “needs as a community member” and became incensed when her request to make a presentation at a May 2011 Work Group meeting was declined. In addition, Walsh had managed to attract other disgruntled characters, some who were oddly enough completely new to the community yet opposed to both a full cleanup of the site and the Work Group. Equally troubling were the disruptive tantrums that Walsh now threw regularly in meetings that even caused some community members to fear for their physical safety. These concerns were expressed to Raphael and other DTSC staff, who did nothing. In October 2011, cleanup opponents sent a spate of nasty e-mails to DTSC demanding that Hirsch be removed from the Work Group and the panel membership be modified to include them. In response, DTSC cancelled the upcoming Work Group meeting. In January 2012, it cancelled the PPG meeting as well. The following month, DTSC cancelled another pending Work Group meeting and announced that the EPA would be ending its role as the facilitator and sponsor of the Work Group meetings, so it would be reviewing the needs of the entire community. As months went on, the lack of meetings and failure to produce a new public participation plan created a void that Walsh used to reintroduce a CAG. On July 30, Walsh submitted a second online CAG petition, and the department immediately approved it. This concerned longtime activists, as Walsh had previously been suspected of creating false identities to criticize cleanup activists on online forums and news websites. Indeed, evidence obtained by EnviroReporter.com shows Walsh assuming various online identities to attack community members viciously, even using one alias to claim she had cancer. But the law actually says otherwise – Cal. Health & Safety Code §25358.7.1. 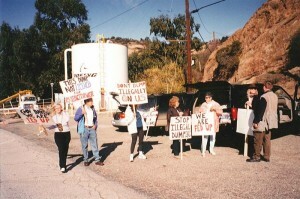 (a), states that the petition must be “signed by at least 50 members of a community affected by the response action at a site.” Many names on the online petition lived out of the area, some gave no last names, and the petition even included former DTSC staff-turned-KB Home-lobbyist Norm Riley and DTSC press contact Susan Callery. Further, the petition service, Signon.org, does not reveal any contact information to petition targets, so it would be impossible to verify that the signers were real people. After DTSC received a letter from the Rocketdyne Cleanup Coalition’s attorney protesting the process, DTSC asked Walsh to turn in another petition. 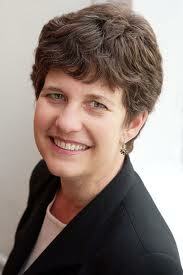 DTSC accepted this unhappy petition signer as valid for the new astroturf CAG – see DTSC website. According to her blog, Walsh went to a local Starbucks to collect the signatures, and turned it in on September 12. A review of the petition shows only a handful recognizable names from the SSFL cleanup community. 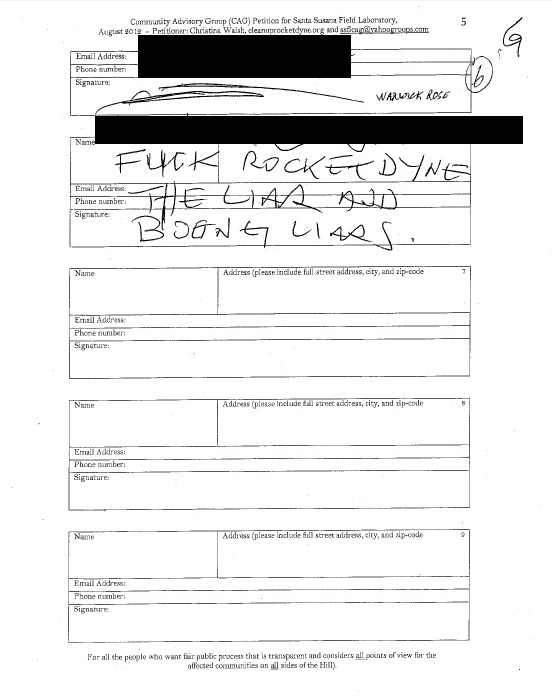 Page 23 even reveals a most questionable signature, see image right. According to a letter from DTSC that Walsh also posted, DTSC’s verification procedure involved simply reviewing zip codes of the signers and approving the ones that were within five to ten miles of the site. DTSC redacted the contact information for the signatures, so there is no way to independently verify that the petition is valid. Of course, blocking the document from public scrutiny only served to place the CAG – and DTSC – under further suspicion. At the same time that Walsh was working to create a CAG, longtime community members were fighting to save the Work Group. DTSC and Cal-EPA provided many excuses for why the group couldn’t be continued, none of which held up to fact or reason. At first, Debbie Raphael told the Work Group members that DTSC didn’t do “membership groups”, and that she had never heard of a group whose members continued in perpituity. But Raphael’s own External Advisory Group (EAG) is comprised of “environmental groups, representatives from Industry, and individuals from local communities” who are not democratically elected and who continue on the EAG in perpituity. Last August, community members met with Miriam Ingenito, Assistant Deputy Secretary for Cal-EPA and were told that the state lacked the legal authority to convene the Work Group, and they should either ask the federal government to fund and convene the group or ask members of the legislature to provide DTSC the authority to convene the Work Group. This, plainly put, is hogwash. No such statue is required, and since all DTSC’s remediation efforts including public participation are reimbursed by the responsible parties, it could, in fact re-establish the Work Group at no cost to the agency. 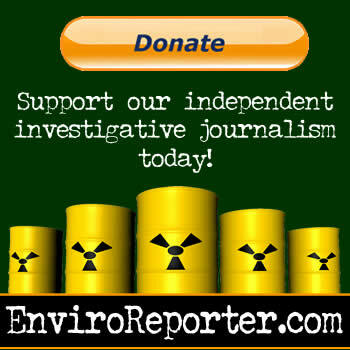 Activists were also concerned that the run-around they were getting was further delaying the public from getting important information about the cleanup, specifically, the recent high radiation readings at the site. With no Work Group, there was no way for the public, press, or elected officials to find out about the new contamination data or compliance with the cleanup agreements. Perhaps, they worried, that was the point. 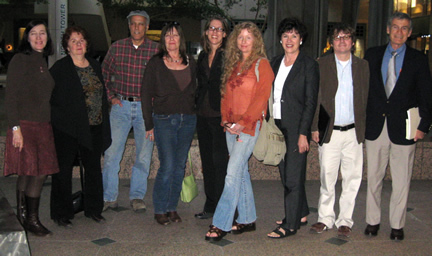 DTSC dissolved the SSFL Work Group, which had served the community for over 20 years. On September 21, the writing on the wall became an e-mail announcement from DTSC officially terminating the PPG and the Work Group and announcing that public participation for SSFL would be replaced by Walsh’s Boeing-funded CAG. Though the announcement said that it had “decided to honor the wishes of a large portion of the community to continue the operation of the Interagency Workgroup,” it also made it clear that the Work Group that the public demanded – an operational, funded, Interagency Work Group – would be no more, to be replaced by a community-driven group that DTSC would have little to do with. The so-called “reasonable, science-based approach” reflects the Boeing-inspired contention that cleaning up Rocketdyne back to normal is too great a task and would mar the otherwise scenic site – even though much of the contaminated soil is in already disturbed areas, not pristine wilderness. Longtime activists say 95% of the contaminated land would not be taken to a licensed dump for chemically or radiologically contaminated dirt, concrete, asphalt and an array of materials that sit outside in the elements at Rocketdyne. Luker also seemed quick to forget that his once-again ally Walsh, according to his own claims, threatened to kill him as he spins this “culture of fear” blamed on the Hirsch without any evidence. A team of six DTSC came with their own kind of shovels to a meeting with members of the SSFL Work Group October 25. DTSC said it would come to only two Work Group meetings a year, that is if the volunteer members could manage to even find a place to meet since the department would provide no funds. The DTSC hit squad explained that what the community really needs is a CAG free from the strings of the government. The department seemed to be going over and above the call of duty to assist Walsh, however, when the it debuted its membership application for Boeing’s SSFL CAG on November 16, stating that DTSC, not Walsh, is soliciting members. DTSC also revealed that it would be spending $5,000 on a “mediator” to get the CAG going, funds that would have paid for the renting of a hall for the quarterly Work Group meetings for a year and a half. In addition, the agency also paid $1,398.80 for newspaper ads in the Daily News, Ventura County Star, and the ACORN, according to Charlotte Fadipe, DTSC chief of media and press relations, in a November 29 e-mail. These expenses are supposed to be reimbursed by the responsible parties at SSFL. Perhaps the worst insult added to a list of injuries from DTSC was its refusal to even let the Work Group have its own mailing list back and and to put out notices for any future meetings. 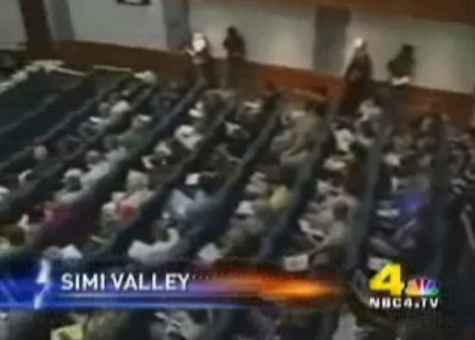 Without the list, it would be impossible to notify the hundreds of attendees who filled the Work Group’s venue, the Simi Valley Cultural Center, shown in this 2006 news segment to the left which featured a study by the SSFL Advisory Panel on health effects from the 1959 meltdown. But Work Group members say that is not what happened. They say that DTSC claimed it didn’t have the list and would check and get back with them. It was only through an interview with EnviroReporter.com that the Work Group learned about the status of their request. Members were also taken back to be referred to as “the general public” instead of Work Group members, which they interpreted as a sign of DTSC’s disregard for them. DTSC’s November 16 announcement states that the SSFL CAG membership will be “reviewed and considered by a Selection Panel in early 2013.” Once DTSC is done helping establish the CAG, the CAG must seek it’s own funding. That will presumably come from Boeing, given Walsh’s early exchanges with Boeing about funding the CAG. These are the darkest days of the fight to clean up Rocketdyne thanks in great part to the coordination between Boeing, DTSC and these third-party allies like Walsh and Luker. In the two years since Governor Jerry Brown took office, the department has done more to isolate and eliminate cleanup activists than has happened at any other time in the 23 years the Rocketdyne Cleanup Coalition has been fighting for full remediation of SSFL.